Dr. Usha B.R. is an obstetrician and gynecologist in Apollo cradle Jayanagar 5th Block, Bangalore with a passion for treating Infertility and High Risk Pregnancy. 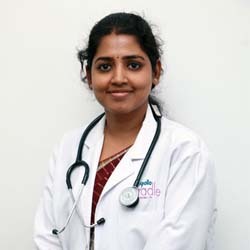 Her expertise also includes Gyne laparoscopy and Hysteroscopy.An essential part of Dr.Usha’s practice is dedication towards her profession and in turn her patients.She wants to see her patients sail through conception easily and go home with a healthy baby.She has passed out of Christ College as College topper in 2000. She joined the best medical school in the state, Bangalore medical College and Research Institute where she did her MBBS, MS .Then she topped the entrance exam at All India Institute of Medical Sciences, Delhi where she did her Senior Residency for 3 years. She has been trained in basic Obstetrics from BMCRI. She has been trained in High risk pregnancy, Gyne Laparoscopy, Hysteroscopy, Infertility including IVF at AIIMS, Delhi. Best doctors and nursing staff are the assests of Apollo Cradle. I am overwhelmed with joy by the care and support received from the entire staff. I was initially tensed but Dr. Usha had cherished me with her positive words. I also mention the kind nature of all the nurses here. Very positive place to go for. I recommend my family and friends to choose Apollo Cradle. My Doctor Usha is very compassionate and caring. I am very blessed to be under her care. She talks very kindly and makes all the patients feel comfortable. All the infrastructure and interiors were excellently designed and organized. Five stars to Apollo Cradle! Apollo Cradle has provided us with great service. I was under the care of Dr Usha for my delivery. She is helpful and made me understand everything clearly. The nurses are friendly and approachable, I did not feel any sort of discomfort throughout. The services provided are of good quality and prompt as well. Thank you for delivering value.